The transperitoneal Anderson-Hynes dismembered pyeloplasty approach to the pediatric patient is similar to the adult patient (35-38). A retroperitoneal approach to the robotic-assisted pyeloplasty has been described in the pediatric literature, but is less commonly performed (39). After performing a cystoscopic, retrograde pyelogram to demonstrate the ureteropelvic junction obstruction and placement of a ureteral stent (this may be placed at completion of the repair as an options), the patient is placed in the modified flank position at about 45° to permit transmesenteric access to the pelvis and/or to mobilize the colon medially. 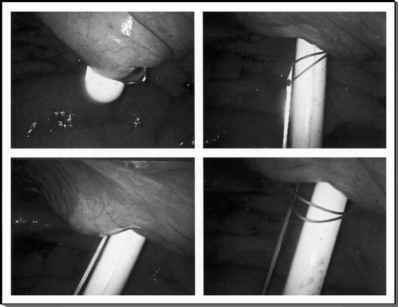 In children with extensive mesenteric fat, mobilization of the colon may be a safer approach. Some authors have suggested performing the initial mobilization of the ureteropelvic junction using the robot, but until a surgeon is completely comfortable with the robot, we suggest starting with a standard laparoscopic approach to mobilize the ureteropelvic junction. A Hasson approach is used to place a 12-mm supraumbilical trocar for the camera. Two 8-mm robotic trocars are placed in the left anterior axillary line under direct vision (5-mm ports and instruments are likely to be available in the near future). A fourth 5-mm is placed in the left flank just anterior to the colon. After the renal pelvis is exposed, it is incised leaving a handle of the pelvis and ureteropelvic junction on the ureter for manipulation. Generally a stay suture is also placed at the medial portion of the ureter to aid in retraction. The ureter is spatulated laterally, and any diseased ureteropelvic junction is excised and sent to pathology for evaluation. The previously placed ureteral stent aids in identification of the ureter. The posterior wall anastomosis is started with running or interrupted absorbable suture, usually a 5.0 or 6.0 monocryl. The water-tight anastomosis is finished after the closure of the anterior wall. A JP drain is placed and brought out through the 5-mm port. The transmesenteric incision is closed with a running 4-0 chromic to retroperitonealize the ureter and pelvis. All other ports are closed with fascial stitches that are generally placed at the time of port positioning. A bladder catheter is left in place overnight and then removed in the morning. The JP drain is removed prior to discharge usually the next afternoon.